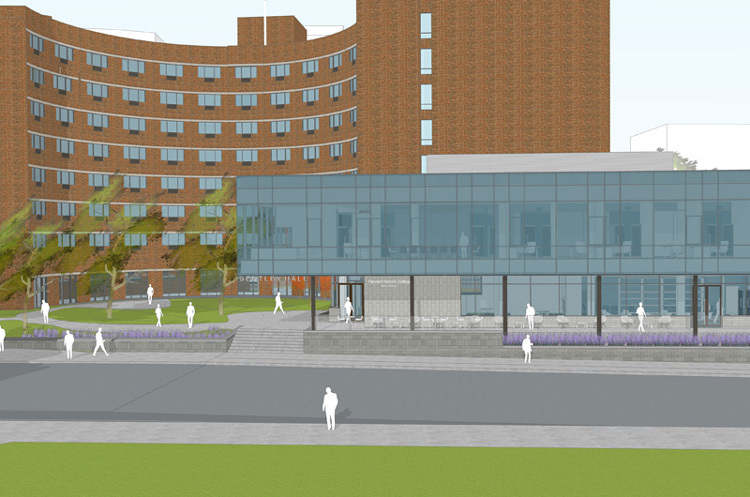 Rendering of Bentley Hall that includes the existing Calhoun Hall and the two-story addition. Philadelphia — With the help of a $5 million gift from Greg S. Bentley, CEO of Bentley Systems, and his wife Caroline, Drexel University will create a new epicenter on its campus for honors students. The gift comes at a time when construction is already underway at Calhoun Hall, an existing student residence hall, that will be fully renovated as part of Greg and Caroline Bentley Hall, a new complex that will house a true “living/learning” community for honors college students. In addition to the renovated student residence, Bentley Hall will also include a new, two-story glass and stone addition of about 10,800 square feet that will house the Pennoni Honors College offices and seminar rooms. “I’m deeply grateful to Greg and Caroline Bentley, whose generous support will raise to a new level the already transformative honors experience for our most academically talented undergraduates, while also creating a state-of-the-art addition to our campus,” said Drexel University President John Fry. American Campus Communities is the lead developer of the $35 million project that will be completed in two phases. The first phase includes completing the renovation of Calhoun Hall that was constructed in 1972 and designed by Vincent Kling, a famous local architect. The renovated residence hall will accommodate about 380 students and is scheduled to open by fall 2019. During the second phase of the project, the two-story addition will be completed. Scheduled to open in 2020, the addition will include three seminar rooms, offices for the Pennoni Honors College, and collaborative study and social lounges. Unlike three other student residences on Drexel’s campus that are owned and operated by American Campus Communities on leased space — Chestnut Square, The Summit at University City and University Crossings — Bentley Hall will remain a Drexel property. The new space is an ideal environment for the Pennoni Honors College and its students to flourish. The College currently sponsors initiatives that serve 1,500 honors program students and the Drexel community at large. The College encompasses five distinct units that overlap in significant ways: the Honors Program serves selected, high-achieving students with coursework and special programming; the Office of Undergraduate Research supports student research across the University and matches students with faculty mentors; the Center for Interdisciplinary Inquiry offers a changing series of cross-disciplinary courses, as well as a program where qualified students can craft their own field of study; the Center for Scholar Development helps students prepare and apply for competitive grants and scholarships and offers workshops on mentorship; and the Center for Marketing and Media offers students the opportunity to be involved with a nationally recognized online journal, The Smart Set, and a nationally distributed television talk show, “The Drexel Interview,” as well as a podcast, “Pop the Question,” that involves faculty and students discussing topics in popular culture. A new Center for Civil Discourse at the Pennoni Honors College will also provide a shared space to encourage civil interactions and dialogue in today’s vexed political environment. The Center will encompass the existing Pennoni Panels, which have developed a following over the past several years for bringing together experts and activists from various institutions and affiliations to address important and controversial topics from a variety of perspectives. Although the Bentleys and their family did not attend Drexel, they have become appreciative supporters of the Drexel education and the Honors College. Bentley Systems helped establish the College’s App Development Lab. As a Drexel trustee and chair of the Pennoni Honors College Advisory Board, Greg Bentley has been a counselor to Cohen and an advocate for a consolidated space for honors programming over the years. A number of Drexel alumni currently work at Bentley Systems and typically about eight Drexel students work annually in paid cooperative education jobs at the company. Bentley Systems is the leading global provider of software solutions to engineers, architects, geospatial professionals, constructors and owner-operators for the design, construction and operations of infrastructure, including transportation and other public works, utilities, industrial and resources plants, and commercial and institutional facilities. Headquartered in Exton, Pennsylvania, Bentley Systems employs more than 3,500 colleagues, generates annual revenues of $700 million in 170 countries, and has invested more than $1 billion in research, development and acquisitions since 2012. From inception in 1984, the company has remained majority-owned by its five founding Bentley brothers.